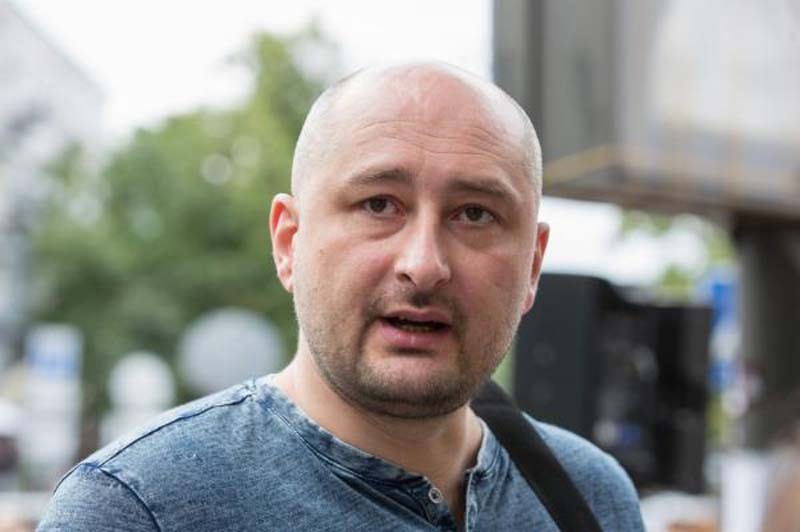 Russian journalist Arkady Babchenko surprised everyone Wednesday by showing up alive at a news conference on Ukrainian television, a day after he was reported dead, telling reporters his death was faked as part of a special intelligence operation. Ukrainian authorities said Tuesday Babchenko had been killed at his home by an assailant, leading Moscow and Kiev to blame each other for his death. Babchenko, a Kremlin critic, left Russia last year after criticizing the Moscow government. In a shocking twist Wednesday, he turned up alive at a news conference and revealed he was informed a month ago about the plan to fake his death. "I want to say sorry for what you felt. I had to bury my friends and colleagues many times," Babchenko said, also apologizing to his wife and friends, who were unaware of the secret operation. "I apologize to my wife. Olechka, forgive me, but there was no other choice," he said. Ukraine's Security Service said the operation foiled a real attempt against Babchenko's life. Agency Chief Vasily Gritsak said the killing was ordered by "Russian special services" and there was "indisputable evidence of the terrorist activity of Russian special forces in Ukraine." "The paymasters promised the contract killer ... $30,000, with $15,000 of which transferred as an advance payment," Gritsak said, adding an intermediary received $10,000. The person recruited for the killing and the mastermind of the plot have both been arrested, the Security Service said. Ukraine Interior Minister Anton Gerashchenko wrote on Facebook the Security Service went to great lengths to fake Babchenko's death. "We created and published staged photographs of the supposedly murdered Arkady Babchenko and distributed a composite sketch of the supposed killer," Gerashchenko wrote. "Law enforcement couldn't fail to understand that news of Arkady Babchenko's murder would bring pain to thousands of hearts around the world." Russian Foreign Ministry Spokeswoman Maria Zakharova said Wednesday finding out Babchenko was still alive came as the "best news." "Let it always happen," she said. "It is a pity that masquerade has failed in other cases. It is evident that the propagandistic effect was meant to make up the story."